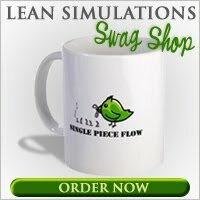 Update: This Lean Lego simulation can now be found on scribd.com. Read my updated post regarding this game. Another free Lean Lego Game can be found on the Aberdeen Lean forums, a website set up to share Lean practices in South Dakota. This is a full-fledged lean lego simulation that teaches the basics of pull vs push, kanban, takt time, 5S and flow. A detailed .pdf file for the facilitator gives clear instructions on how to run the game, including a list of all the materials needed. The simulation uses only basic building blocks, which are readily available. No fancy pieces required. Using two stations, the operators build Lego assemblies in a variety of colours. Through five runs, the team improves the process from a standard batch manufacturing philosophy, to a kanban based pull system. A second .pdf file serves as a presentation or guide to follow while running through the simulation with your team. Although there are no funky pictures of Lego animals like the other Lego game from the University of St. Andrews, the instructions and presentation are clear and provide plenty of information, useful to be interspersed within a full day of Lean training. The files can be found on the links page. Note: I did have some trouble viewing the links page in my browser (blue background), but they can be found toward the upper right of the screen. I've already heard that Lean Lego game from a friend, and he told me how cool that simulation is. From his point of view, he said that Lean is about optimization of work flow. And to do this, companies must eliminate wasteful procedures that contribute to less-efficient work force. Well, I think every companies should have this, too!